To paraphrase is to use your own words to interpret the author's meaning. Help your young readers develop this important reading comprehension skill with this handy template that will help them learn to paraphrase any piece of writing by answering a few open-ended questions. Use this reading comprehension passage with your students to practise determining the meaning of unfamiliar words. Students will read a Lewis Carroll passage and write a summary, noting words read per minute and added details. Your students will read a Brothers Grimm passage and write a summary, noting words read per minute and added details. Use this resource to help your students identify and explain the problem in a passage using past tense verbs. Use this passage as an opportunity to work on reading comprehension, and explore Aunt Em's character inside and out. This passage will challenge your 3rd graders to think deeper into the text to strengthen their comprehension skills. 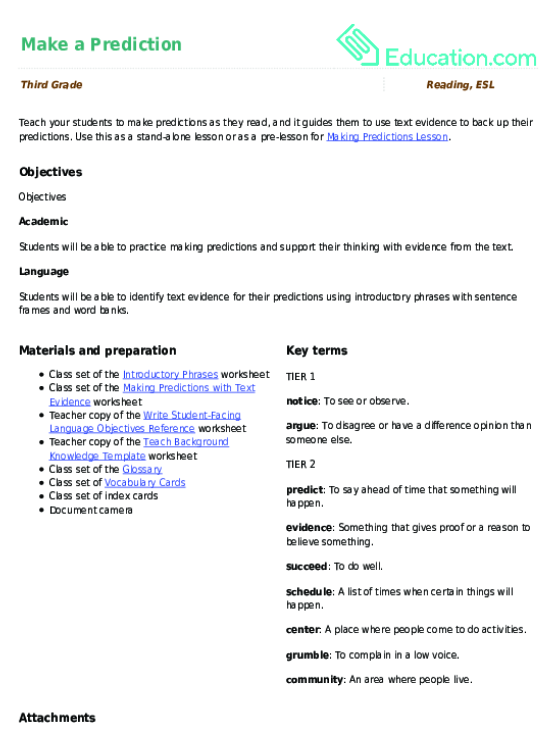 Use this as a stand-alone lesson or as a pre-lesson for Making Predictions Lesson.